I’ve been distracted. 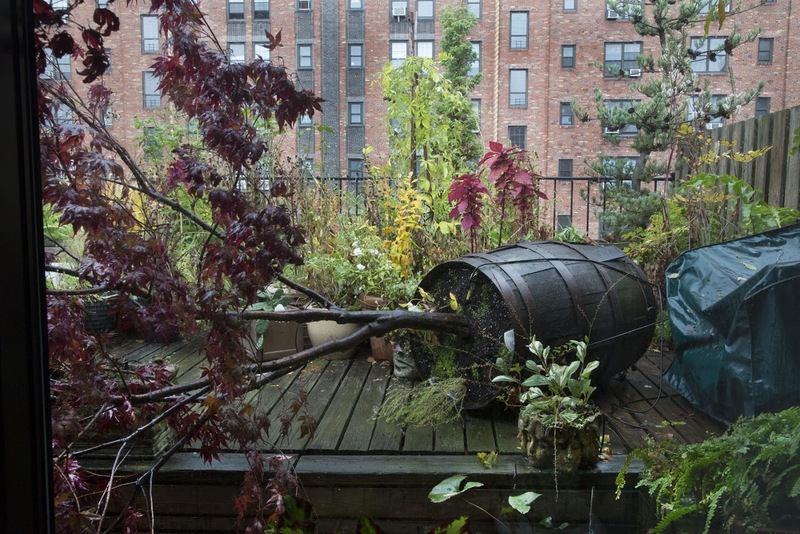 Hurricane Sandy – terrible name, but then, is there ever a good one – knocked out our electricity, hot water, and heat. Then the election raised our blood pressures and anxieties. Trolley cars grew in my stomach, turning round and round. [That’s a Yiddish curse my paternal grandmother used to say.] Though our neighborhood was lucky compared to others in New York and New Jersey, it was a difficult time to concentrate on writing. We were lucky too, our Maple tree tipped over but is otherwise intact. During this period I had a front row seat observing neighbors and strangers at their most noble. People shared food, batteries, hugs, and information. Whoever was going somewhere bright offered to bring back goods to those in darkness. Real people who help others is a leitmotif in many of our books. We ask the questions, “When faced with adversity does one rise up or fall down? What does a person have to do to live a noble life?” This theme is not only an important one for kids, but it is usually implanted inside a damn good story. “Noble,” stayed with me throughout the hurricane and election. I asked myself which nonfiction stories for kids include the search for virtue? I called my friend and YA librarian Karlan Sick to brainstorm titles because Karlan remembers every book that has ever been written. She talked about the obvious greats who made a difference in society: FDR, Eleanor, Jane Addams, Jackie Robinson, Martin Luther King, Jr. But these were not the first people she came up with. 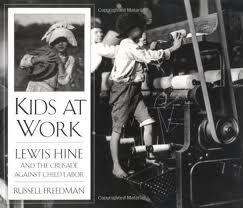 Her first title happened to be one of my all-time favorites: Russell Freedman’s Kids at Work: Lewis Hine and the Crusade Against Child Labor. The book is about the dazzling photographer Louis Hine, and how his photographs changed the way people think about working children. In the early twentieth century Hine, who was a photographer, sociologist, and a New York City schoolteacher, documented working children on behalf of the National Child Labor Committee. His powerful, heart-wrenching photographs helped to awaken America’s conscience and later contributed to social reform with much needed labor laws. Unfortunately Hine never knew what an impact he made. Museums had no interest in his photographs; he survived on welfare, and died penniless. Frankly, I cannot understand why he is not on EVERY list of great photographers. If you click on his name you will see more images, many of which are very well known. 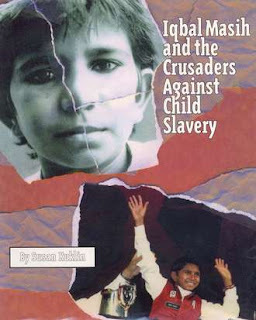 Iqbal Masih’s story along with the “crusaders” who helped free him from his thekedar at the carpet factory in Pakistan where he worked from age four to ten, is eerily similar to Freedman’s American kids: Exploitation supported by unknowing shoppers. Economics skewed to favor the rich. Danger to those who try to bring about change. Sound familiar? Half a world away … half a century away … things haven’t changed for many. No wonder our subtitles are so similar – I just this moment realized that. Louis Hine was noble. Iqbal Masih was noble. And so were crusaders who risked so much to speak out for what is right. What have you written, or read, that inspired you to write about someone noble? Can we make a list? To add to your list of books about heroes, I suggest Susan Roth's book THE MANGROVE TREE: PLANTING TREES TO FEED FAMILIES (Lee & Low, 2011). This book describes the work of Dr. Gordon Sato and his project to plant mangrove trees--which grow in salt water--in the African country of Eritrea. These trees helped relieve poverty and hunger. You could also include the books about Wangari Maathai--Donna Napoli's MAMA MITI: WANGARI MAATHAI AND THE TREES OF KENYA (S & S, 2010) and Claire Nivola's PLANTING THE TREES OF KENYA: THE STORY OF WANGARI MAATHAI (FSG, 2008). This is a cluster of related books about two people who made a difference in the lives of many people. MANGROVE TREE is a terrific addition. Loved that book and look forward to reading MAMA MITI & PLANTING THE TREES. Thanks for writing. It's not too late, INKers, to add to the list. Loved the way you talked about disaster and heroes, and made me feel inspired to write today! I'm reading this post days late, but thank you for it, Susan! Noble, just five letters, but such a big word to live up to. Once I can think about it more in terms of Lewis Hines and not Gandhi, I've written about some people who did what they thought was right with far reaching effect. Saving the Whooping Crane is about the work of scientists and volunteers to bring this bird back from extinction. I was drawn to the story because (for reasons too long to explain here) scientists raising the birds wore whooping crane costumes so the birds would not become accustomed to humans and they disguised an ultralight plane to look like a bird to teach them how to fly and migrate. I think what's noble about this project is that it is so daring in scope, it enlisted so many state agencies, public and private groups and individuals to carefully save what we so thoughtlessly destroyed. This makes me think that noble is also people doing their jobs or just being people at their best and working together to do something bigger than themselves. How about Team Moon? Thank you Deborah! And Susan? I couldn't agree more.